Tasks are individual pieces of work that can be prioritized and selected to reoccur based on its due date. If tasks are related to one another, they can be created under a common Task List and selected to depend on each other. This area contains the Inbox List, Database Task Lists, and any task lists that are not associated to milestones. You can also choose to sort your task view by assignee or by tag in this area. Every Workspace has a Task Inbox which appears at the top of the Task Lists area. This can act as a generic task list which can be used for tasks that do not associate with any particular task list. Tasks can be created through the Task Inbox email address and then moved to specific task lists at a later time. To locate the Task Inbox email address, under Task Lists click Inbox > the drop down options menu > Email Tasks to this Task List. A pop-up will generate displaying the email address and instructions on how to create a task. This allows teams sharing responsibilities to self-assign tasks that have been generally placed in this inbox. Databases can be configured to allow tasks to be associated with records. Database tasks can be viewed directly in the record by selecting the eye icon next to a database record or under the Project Management tab. 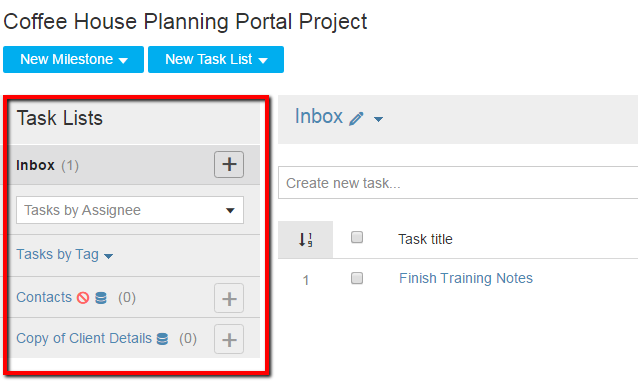 The name of the task list in the Project Management tab will match the name of the database. For example, a database called Product Catalog would have a matching task list in the Project Management tab called Product Catalog Database. 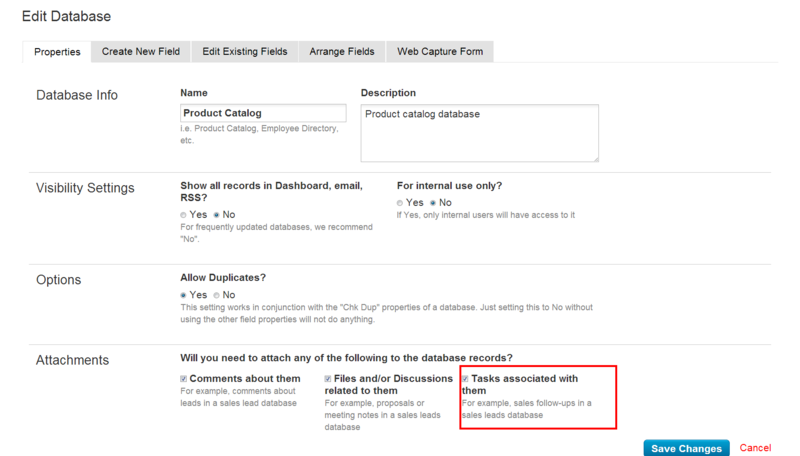 Database Task Lists cannot be edited, deleted, cloned or associated with a milestone. To turn on database tasks, go to a database and navigate through Options>Database Actions>Edit >check the box next to Tasks associated with them>Save Changes. To disable database tasks un-check the same box and then select Save Changes. Click the Edit icon when viewing a task list to access additional options. Archive Task List: archive the task list to view at a later date. Note: only task lists not associated to milestones will have the Archive option. 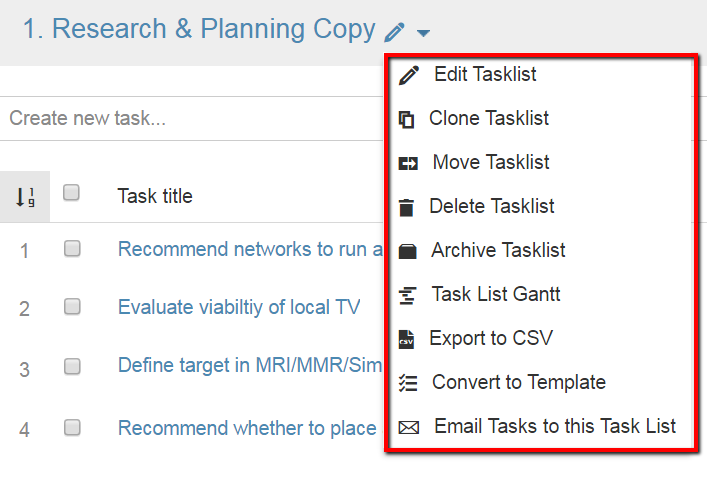 Task List views provide the ability to edit the fields with a double-click of the mouse. Hover the mouse over the fields in your task list and double click to edit the fields within the Task List. All Archived Milestones and Archived Task Lists can be viewed by clicking on Go to Archives located in the Options menu of any task list. When viewing the archives, items can be un-archived by selecting Un-Archive Tasklist (or Milestone).